Learn how to start a blog in less than an hour. Follow the step-by-step instructions we used when starting our blog, which now has reached more than 20 million people and has been featured in the New York Times, TIME magazine, and on the TODAY show. 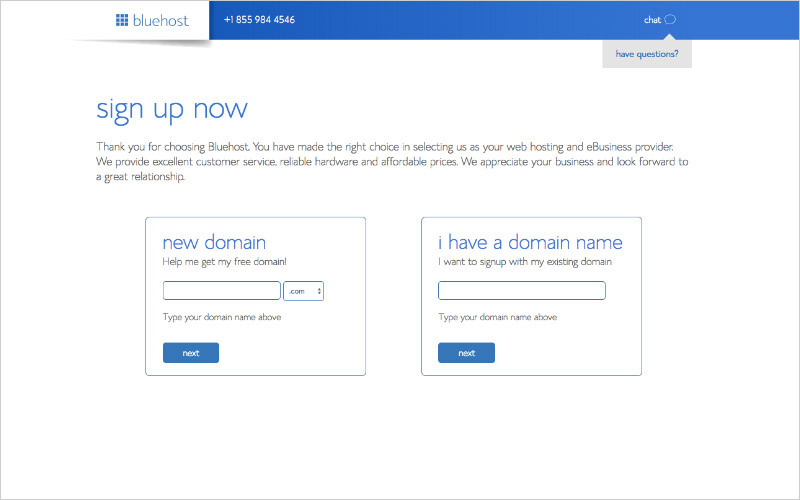 Choose your domain name and host. Set up your blog with WordPress. 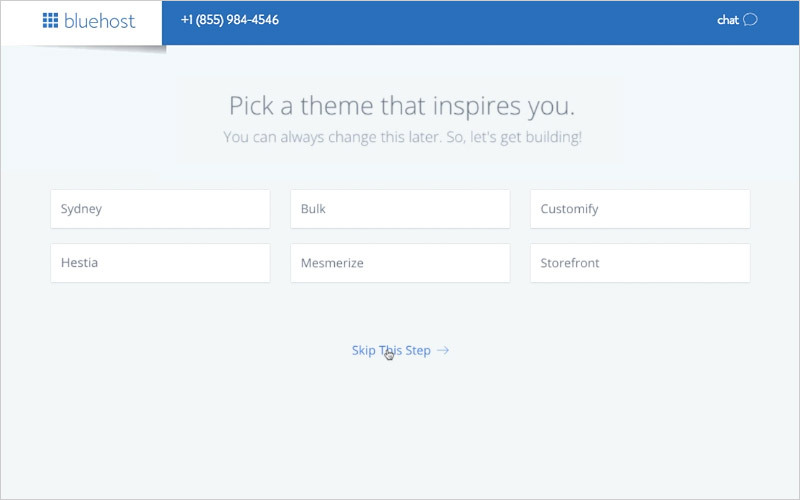 Design your blog with a theme. Start blogging with compelling content. 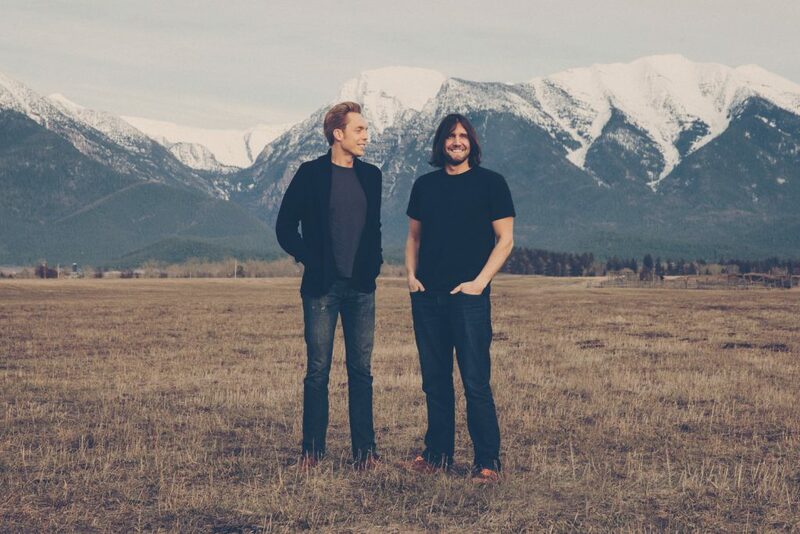 NOTE: The Minimalists’ blog is hosted by Bluehost. 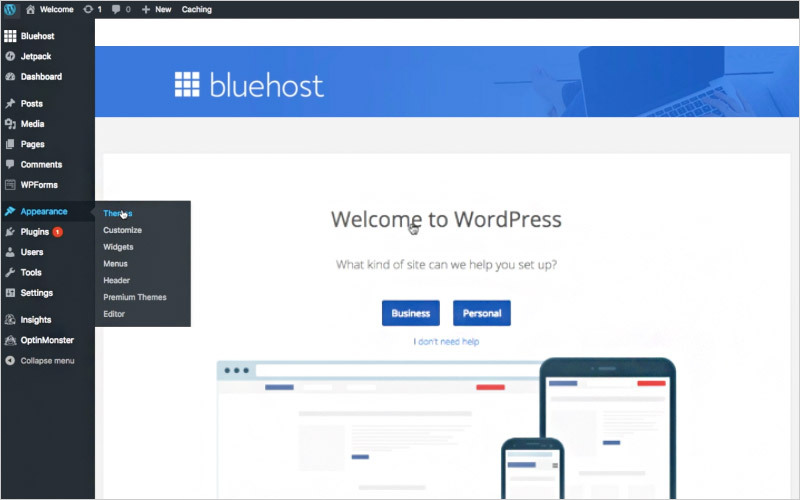 For only $2.75 a month, Bluehost can help you set up and host your blog. Because The Minimalists are a Bluehost affiliate partner, our readers can use this link to receive a 50% discount off the monthly price and a free domain for the first year. Disclosure: Some links in this essay (including Bluehost and Constant Contact) are affiliate links, which means we earn some revenue, at no additional cost to you, when you purchase using those links. That’s obviously not why I’m recommending them; I’m recommending them because they’re what I use personally. They’ve added value to my life, and I hope they add value to yours. If you prefer to watch our process for setting up a blog, we’ve created a step-by-step instructional video, How to Start a Successful Blog Today, which shows the entire starting-a-blog undertaking. Otherwise, read on. Want to create something meaningful? Why not start a blog? Creating this blog is one of the best decisions Ryan and I ever made. After all, our blog is how we earn a living. More important, it’s how we add value to other people’s lives. 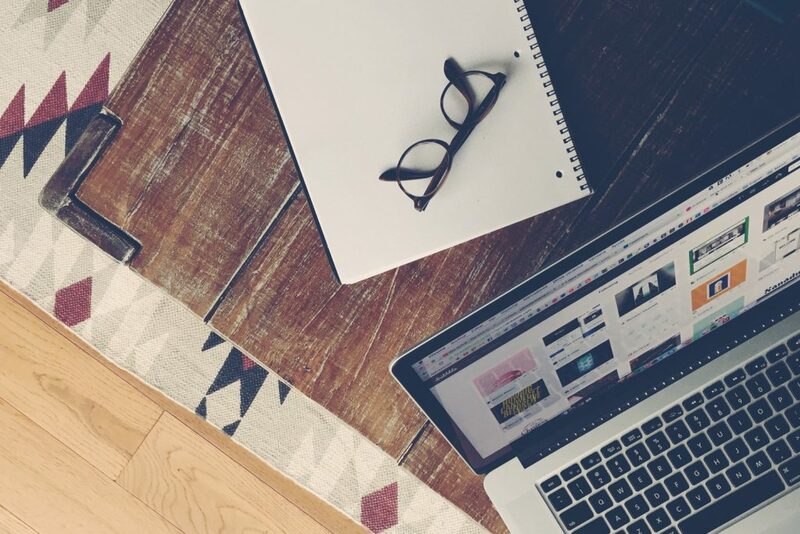 So you’re thinking about starting a blog, but you don’t have any idea where to start, right? Guess what—neither did we! Before we were “The Minimalists,” we wanted to start a blog to communicate our thoughts and express our feelings, but we were overwhelmed with options. Clueless, confused, and confounded with choices, we had no idea how to start a blog or how to be a blogger. When should we start? 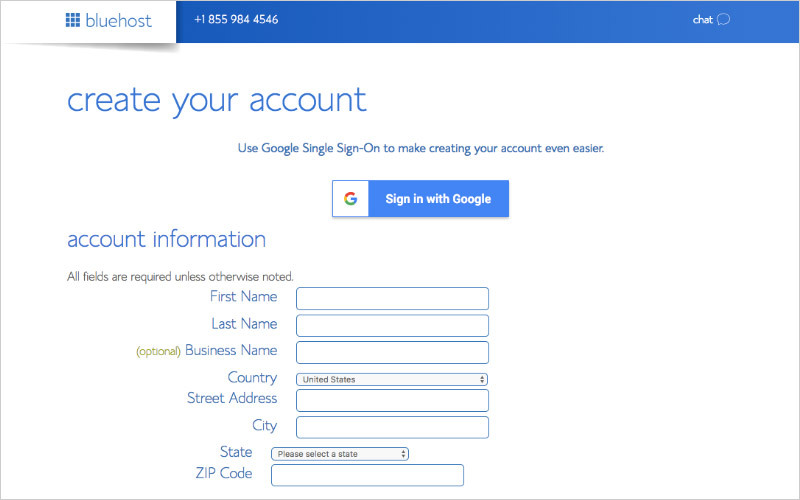 How do we register a domain name? What is hosting? Which blogging platform should we use? How do we choose a template? What is a plugin? What should we write about? Heck, we could hardly spell HTML, let alone build a blog! But good news: it turns out that starting a blog is much easier than you think. We’ve learned a ton of lessons during our ascent to millions of readers, and now you can learn from our pain and suffering to circumvent much of the tedium involved in setting up a blog. Thankfully, you needn’t be tech savvy to start a blog (we certainly aren’t). You don’t need to know how to code or design to build your blog (we still don’t). You don’t need much money to create a blog (you can get a free domain and host your site for just a few bucks a month). And you don’t need to spend a ton of time setting up your blog, either (you can set up your blog in less than an hour). Because we receive so many questions about how we specifically set up our blog, we decided to provide our readers with a soup-to-nuts, comprehensive guide for how to set up a blog. To date, more than 20,168 new bloggers have used our instructions to start a blog. This blog post is intended to function as a how-to manual—a guide that will light the path toward launching your new blog—with easy-to-follow screenshots, step-by-step instructions, as well as additional rationale and insights to improve your blog. While there are other blogging platforms out there like Blogger.com and Tumblr.com, nearly every serious blogger uses a self-hosted WordPress site because of its creative freedom and flexibility. The Minimalists uses WordPress because it gives us greater control over the look and feel of our blog—more creative control than any other platform. Oh, and WordPress itself is free! The first thing we did when starting our blog was go to Bluehost and register our domain, which is free with hosting. We’ll explain hosting in a moment, but let’s talk about your domain name first. Your domain name is an important part of your blog because it creates a first impression—it is the name of your blog. Also known as your URL, your domain is also your address on the web. For example, our domain name is www.theminimalists.com. Once you’ve decided on a domain name, you’ll need to set up hosting for your blog. 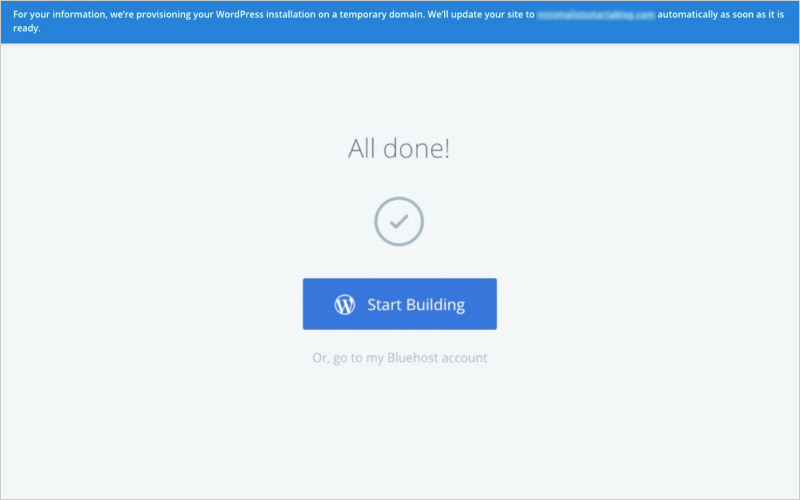 While WordPress itself is free (see Step 2 below), you need a reliable place to host your WordPress blog (your blog needs to exist on a server somewhere on the Internet). We Use Bluehost. We personally use Bluehost to host The Minimalists. If you recommend a company, you better be willing to use their product yourself. We also use them to host several other websites of ours. Outstanding Customer Service. 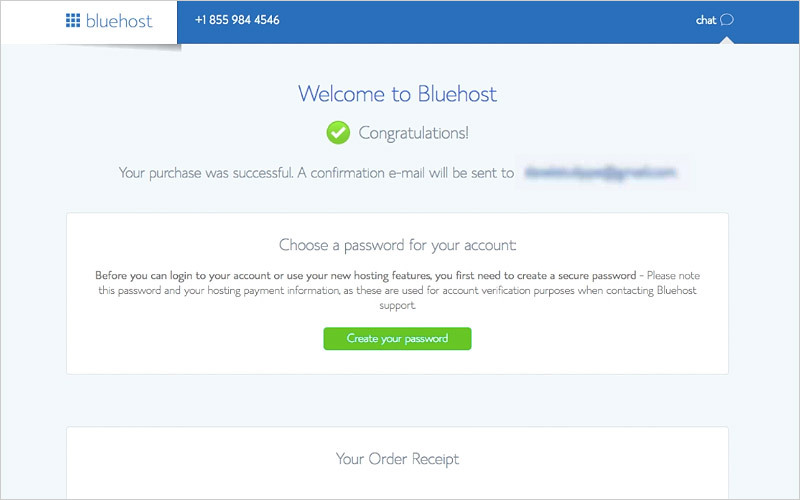 Bluehost’s customer service is 100% US-based. With hold times that average less than 30 seconds and 100% in-house, on-site staff in their Texas offices, you can rest assured that the person helping with your site knows how to help. In other words, if you have any questions, they will help you through the entire set-up process. Great Pricing. TheMinimalists.com is a Bluehost affiliate partner, which means that in addition to using their service, we also receive a commission for referring new customers. To be fair, though, we would still use Bluehost even if we weren’t an affiliate—we’ve used them for a long time. Ergo, we don’t recommend Bluehost just because we’re an affiliate (every hosting company offers a similar affiliate program); we recommend Bluehost because they are the best, most reliable option. Plus, because we’re a partner, Bluehost offers a 50% discount for The Minimalists readers: only $2.75 a month for the first year. That’s an outstanding price! Free Domain. When you sign up for hosting, Bluehost will give you a free domain name, which allows you to avoid the upfront and recurring fees associated with purchasing a domain on your own. 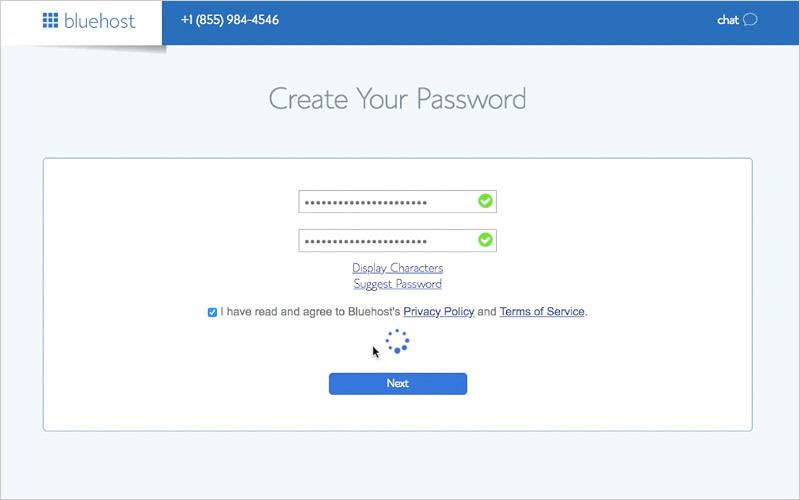 If you’ve already purchased your own domain name, don’t worry; you can still use your domain with Bluehost (it’s just one extra step). Money-Back Guarantee. Bluehost offers a 30-day money-back guarantee, so there’s no risk if you change your mind. Reliability. Bluehost’s facilities are world class. They have their own datacenter and they build their own servers. Their headquarters includes over 50,000 square feet of office space, a custom-built 20,000-square-foot datacenter, and enough backup generators to power a city. Friends & Family. Many of our friends and family also use Bluehost to host their blogs. 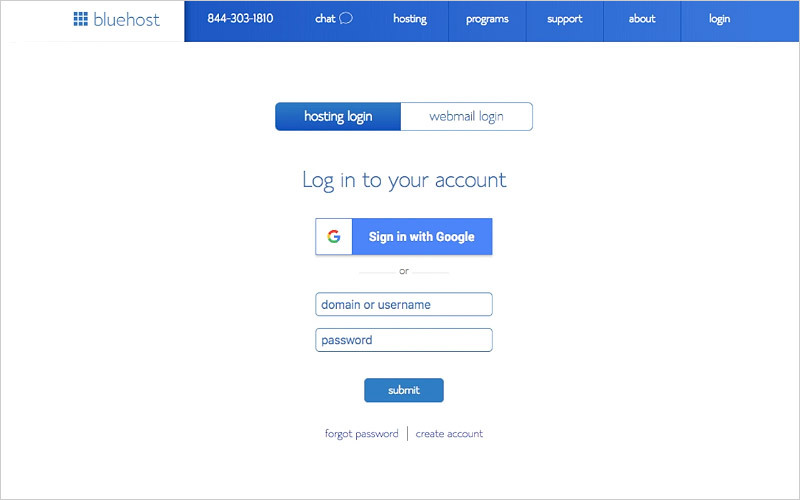 So, now that you’re ready to get started, go to Bluehost and click the “Get Started Now” button. You’ll notice that prices range from $3 to $6 per month, depending on whether you want a basic, single site hosting plan or a more robust plan that allows you to create multiple sites. 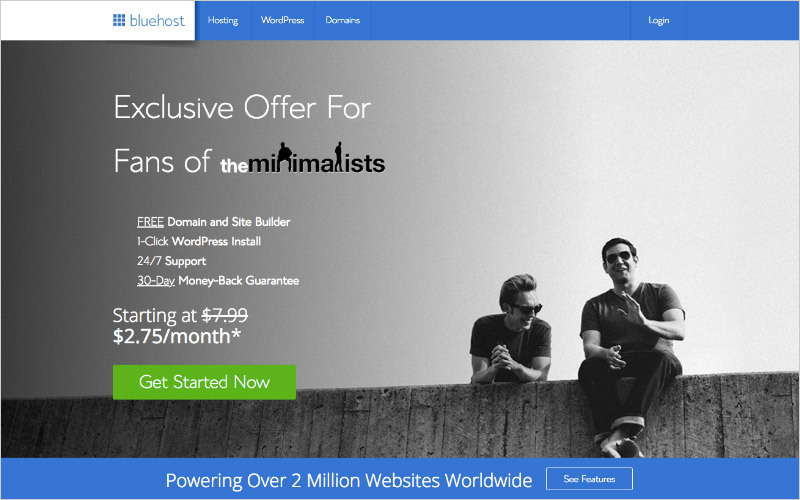 Note: Because we’re an affiliate partner, Bluehost offers a special price for The Minimalists readers: only $2.75 a month for the first year. That’s a significant discount. If you still need to register a new domain, you’ll use the left box followed by your desired extension (e.g., .com, .net, .org). If you already purchased your domain somewhere else like GoDaddy.com, don’t worry, because Bluehost will provide you the information you will need for easily transferring your domain. 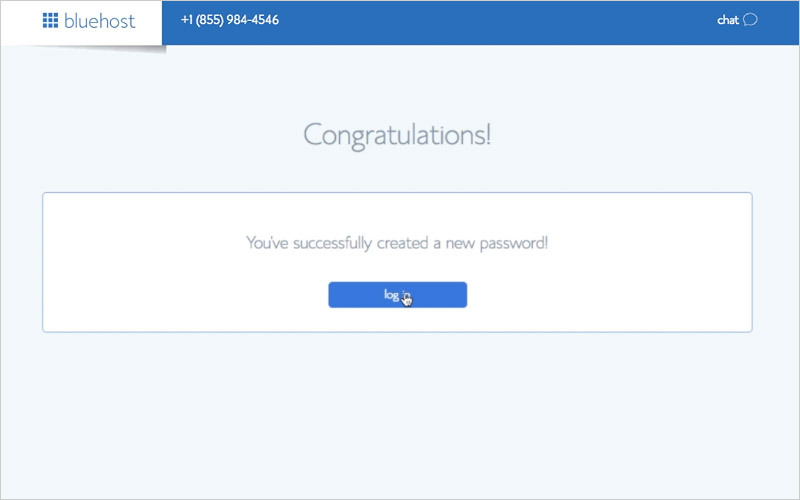 Once your registration is complete, you’ll see a congratulations page indicating that a confirmation email was sent to your inbox. Go to that email and click the confirmation link. After that, click the “Create your password” button. Next you will install WordPress, which is free. Don’t let the word “install” intimidate you, though. It’s much easier than it sounds and Bluehost does all the work for you. Yay! WordPress is now installing and will be completed shortly. A theme allows you to control the specific look and feel of your blog without the need for coding expertise or design knowledge. 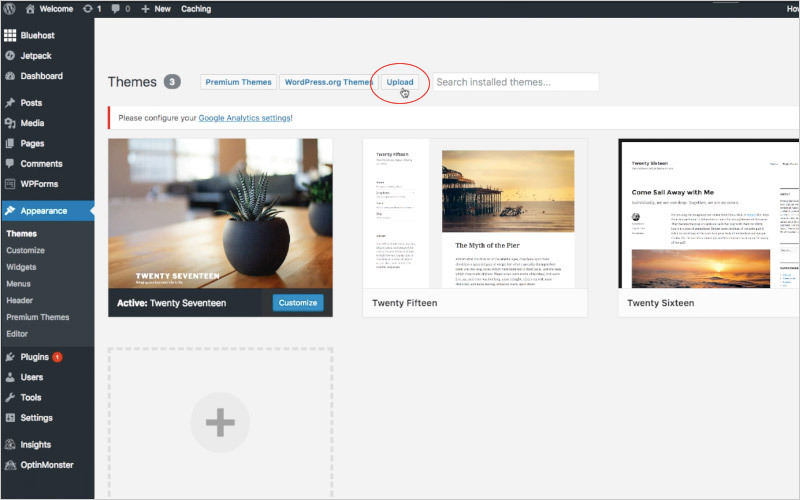 In other words, a good theme helps you to design your blog exactly how you want it to look. If you’re not a coder (I’m certainly not a coder), then a theme makes the design work a million times easier. We use BYLT for our theme, a platform created by SPYR. They have a number of beautiful, simple WordPress themes to choose from, and, in fact, you can purchase the same theme we use if you like. Simply go to BYLT’s site and find the theme that best fits your desired aesthetic. Their themes are feature-rich; plus, once you buy your theme, you will have the same team supporting your work that we trust to support ours. 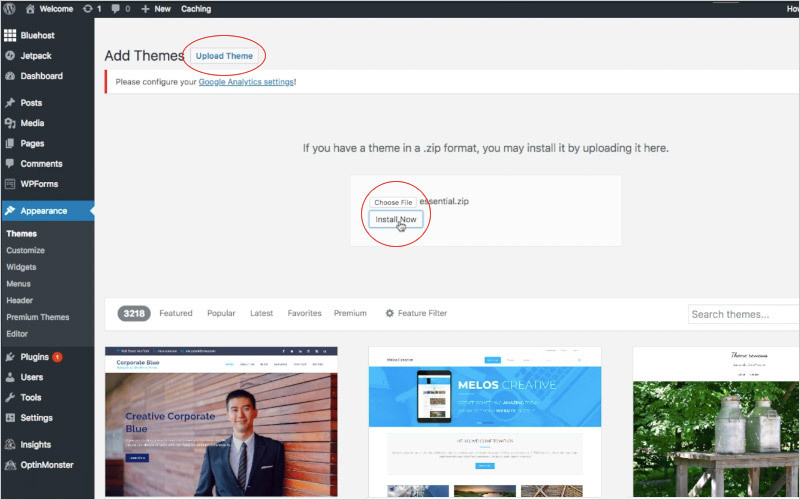 Once you purchase the theme you like, you’ll be able to download your WordPress theme (a .zip file) from your BYLT Dashboard. Save this file to your Desktop because you’ll need to upload it to WordPress in just a moment. Remember how easy it was to install WordPress? Well, installing your theme is even easier. Then, click the “Upload Theme” button followed by the “Choose File” button. 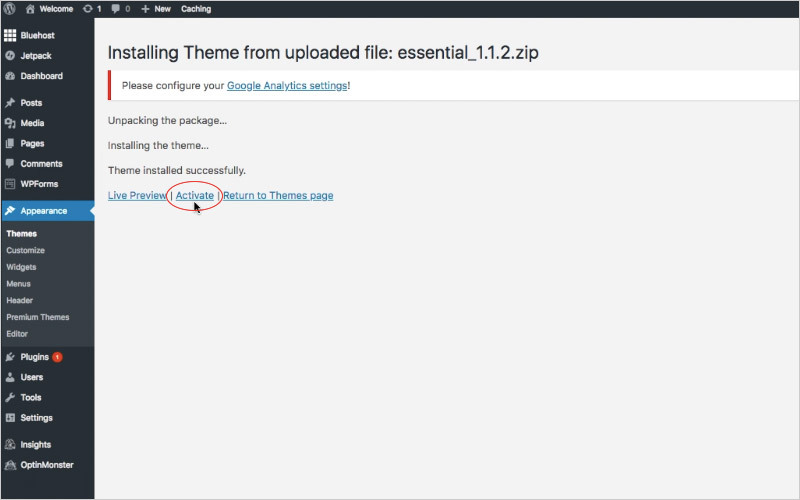 Once installation of your theme is complete, you’ll see a confirmation page indicating that your theme has been installed successfully. Plugins are third-party appendages that add additional functionality to your blog. It’s best to keep your number of plugins to a minimum and install only the best plugins, because too many plugins—as well as unreliable plugins—can slow down your site. We use only a few plugins at The Minimalists (see below). Yoast SEO is the defacto standard SEO plugin for WordPress. For details and everything you’d ever want to know about WordPress SEO read Yoast’s Definitive SEO Guide. Google Analytics for WordPress by MonsterInsights allows you to track your blog’s traffic easily and with lots of interesting data: overall traffic, traffic sources, views per author & category, automatic tracking of outbound clicks and pageviews. Jetpack by WordPress.com is a WordPress plugin that supercharges your self-hosted WordPress site with the awesome cloud power of WordPress.com. Congratulations! You started a blog, and now it’s time to start blogging. This is actually where the fun begins. Content. Start writing and publishing the content for your basic pages: create an About Page, Contact Page, Start Here Page, Archives Page, and any other page you want in the header of your new blog. Design. Experiment with various color palettes, fonts, and design elements within your theme. Logo. Create a basic logo using a program like InDesign, Photoshop, or a text editor (note: even though we have no design skills, we were able to use Apple’s Pages application to create our simple logo after downloading some free vector art and choosing the typeface that best suited our aesthetic), or you can hire someone like 99designs to design a professional logo. Photo. Add a photo of yourself (pro tip: you can start with a well-lit selfie, but when you get a chance, get some professional photos taken; they’re well worth the cost because people identify with other people more than they identify with logos). Images. Spice up your blog posts with high-quality stock photos and images: Paul Jarvis (free), Unsplash (free), Library of Congress (free), iStock (fee-based), Shutterstock (fee-based). Comments. Determine whether or not you want comments on your blog; they are often a useful way to receive feedback and directly engage with your readers. Social. Establish a social media presence on Twitter, Facebook, or Instagram (or all three). Ongoing. Keep tinkering with your blog until you obtain the right look and feel. Publish. Start writing new blog posts. Publish at least once a week so you can build an audience. Below you’ll also find 20 recommendations to improve the writing on your blog, as well as 15 reasons you should start a blog and 3 reasons not to start a blog. We hope you have loads of fun expressing yourself on your new blog. We’re certain it will be a huge growth experience for you during the coming months. Wherever you’re going, make sure you enjoy the journey ahead. We were inspired to research and write this blog post after reading Joshua Becker’s 15 Reasons I Think You Should Blog, in which he discusses 15 great reasons why you should start a blog. Why is the keyword here. Crucially, Becker writes about the purpose of blogging, not just how to start a blog. That’s what many of these other “blogs about blogging” seem to miss: they miss the purpose—the why behind starting a blog. You’ll become a better writer. “At its core, writing is communication. It is about recording thoughts on paper and compelling others to agree with them,” writes Becker. “To that end, writing (just like every other form of communication that has ever existed) improves with practice. Blogging will not force you to become a better writer, it’ll just happen as you do it. And becoming a better writer holds important benefits for the rest of your life—whether you are creating a book, a presentation, a resume, or an anniversary card for your spouse.” Spot on! Writing blog posts is not only a great way to improve your blog writing, it’s a wonderful chance to improve everything you write—from business emails and text messages to that novel you’ve been dreaming of penning. You’ll become more confident. 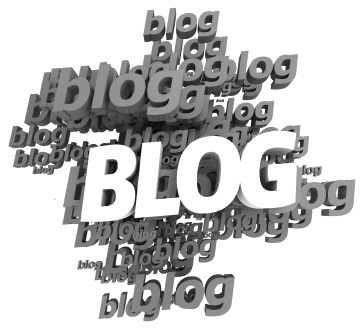 “Blogging will help you discover more confidence in your life,” writes Becker. “You will quickly realize that you do live an important life with a unique view and have something to offer others.” So true! Writing helps us better understand the lives we live and the consequences of our actions. So now you have 15 reasons why you should start a blog, and we’ve shown you how to start a blog, step-by-step, based on our personal experience. Money. You should not start a blog to make money. We need to get that out of the way first. If your primary objective is to replace your full-time income from blogging, forget about it. It doesn’t work that way. Do you think that Jimi Hendrix picked up his first guitar so he could “supplement his income”? No, he didn’t. Rather, he did it for the love of it, for the joy and fulfillment he received, and the income came thereafter—much later actually. Notoriety. Don’t plan on getting “Internet famous” right away. Not every site grows as fast as ours did, but that’s okay. The truth is that we kind of got lucky. We found a great domain name, we cobbled together a logo and site design that people liked, we write fairly well, and our content connects with people in a unique way. We didn’t start this site to become “famous,” though. That’d be ridiculous. Our popularity came as a surprise to us, and it was a result of a little luck and a lot of hard, passionate work. Traffic. Not all traffic is good traffic, so don’t worry about getting thousands of readers right away. Spend your time producing meaningful creations and eventually the audience will show up if you are helping people solve problems. In other words, focus on adding value, not increasing traffic. The funny thing is that all these things can happen. You could make a full-time income from building a blog. We do it, Corbett Barr does it, and so do many others. And you could become Internet famous like Leo Babauta or Chris Brogan. But if these are the sole reasons you start blogging, you’ll be miserable because it will seem like a job, and if it feels like a job, you won’t be passionate about it, so you’ll either hate it or fall flat on your face (or both). We receive plenty of emails asking for advice about starting a blog, about how to blog, about blog topics, and about creating meaningful content. These are the answers and recommendations we tend to give. Find Your Niche. You needn’t have a niche, but it helps. When learning how to be a blogger, it’s important to ask yourself what you’re passionate about. Running? Cooking? Being a parent? Have you found your passion? If so, whatever it is, write about that. If not, then you must first find your passion. Note: We generally recommend that people don’t start a blog about minimalism or the paleo diet or any other heavily saturated topic. But what we really mean when we say this is: don’t create a blog about something unless you have a unique perspective. If you’ve embraced simple living and have a unique perspective, then by all means have at it. Define Your Ideal Readers. Once you’ve found your niche, you need to know who will be reading your blog. For example, we blog about living a meaningful life with less. Thus, our ideal readers are people who are interested in exploring minimalism so they can clear the path toward more meaningful lives. If you want to write about your newborn baby growing up, that’s wonderful: your ideal readers are probably your friends and family. If you want to write about restoring classic cars, that’s cool, too. Tailor your writing to your readers (whether it’s your family or local community or whoever else will read your blog). Add Value. Your blog must add value to its readers’ lives. You want to help people solve problems. This is the only way you will get great quality readers to your site (and keep them coming back). Adding value is the only way to get someone’s long-term buy-in. We both learned this after a decade of leading and managing people in the corporate world. With everything you write, it’s worth asking: Is this adding value? Be Original. Yes, there are other blogs out there about the same thing you want to write about. Question: So why is your blog different? Answer: Because of you. You are what makes your blog different. It’s about your perspective, your creativity, the value you add. Be Interesting. Write interesting blog posts. Especially if you want people to share it with others. Be Yourself. Part of being interesting is telling your story. Every person is unique, and your story is an important one. The important part of storytelling, however, is removing the superfluous details that make the story uninteresting. A great storyteller removes 99% of what really happens—the absorptive details—and leaves the interesting 1% for the reader. Be Honest. Your blog needs to be authentic—it needs to feel real—if you want people to read it. You can be your blog, or your blog can be you. That is, do you really embody the stuff you write about? If not, people will see through it. “Be the change you want to see in the world,” is the famous Gandhi quote. Perhaps bloggers should build the blog they want to write for the world. Transparency. Being transparent is different from being honest. You needn’t share every detail about your life just for the sake of being honest. Time. Once you’ve learned how to start a blog, you’ll learn that blogging takes a lot of time, especially if you’re as neurotic as we are (we spent over eight hours testing the fonts on this site). And see those Twitter and Facebook icons in the header? We spent hours on those, deciding what was right for us). That said, once you have your design set up, don’t tweak it too much. Instead, spend the time on your writing. Vision. The reason our site design looks good is because we have a great host, we have a great theme, and, most important, we had a vision of how we wanted our blog to look. Once we had the vision, we worked hard to make that vision a reality. (Note: neither of us had any design experience before starting a blog.) It’s hard to create a beautiful blog if you don’t know what you want it to look like. Find Your Voice. Over time, good writers discover their voice and their writing tends to develop a certain flow, one that is appealing to their readers. Finding your voice makes your writing feel more alive, more real, more urgent. For additional reading, check out our blog post about Finding Your Voice. We Instead of You. Use the first-person plural when possible. Statements of we and our are more powerful than you and your, especially when talking about negative behaviors or tendencies. The first person comes off as far less accusatory. Think of it this way: we’re writing peer-to-peer—we are not gods. When to Post. Question: When is the best day and time to publish a blog post? Answer: It doesn’t really matter. We don’t adhere to a particular time-of-day schedule, but we do publish at least once a week because consistency is important. You needn’t get bogged down in the details, though. Social Media. Yes, we recommend using Twitter, Facebook, and Instagram to help connect with your audience and other bloggers, but don’t get too caught up in it. Focus on the writing first, social media thereafter. Ignore Negative Criticism and Stupidity. Sure, we get a lot of negative comments and stupid questions from ignorant people who aren’t really our readers (“You’re not real minimalists!”). We call these people seagulls: They fly in, crap on your site, and fly away. But we pay them no mind, because we didn’t start our blog for them. Delete their comment and move on. Research. Spend time researching what you’re writing about. The reason we are able to use so many helpful, relevant links in our essays is because we put in the time to research our topics. Keep It Simple. This is where minimalism can be applied to starting any blog, irrespective of its genre. No need to place superfluous advertisements or widgets all over your site. Stick to the basics and remove anything you don’t need—remove anything that doesn’t add value. Picture. Put a picture of yourself on your blog. People like to see the face of the person who’s writing the blog. If two goofy guys from Dayton, Ohio aren’t too afraid to put their pictures on their site, then you have nothing to worry about. Comments. If you’re going to have comments on your site, then read The Five Words That Kill Your Blog by Scott Stratten. Live Your Life. You’re blogging about your life (or about certain aspects of your life, at least), so you still need to live your life. There are things that we always put before blogging: exercise, health, relationships, experiences, personal growth, contribution. Simply put, live a life worth writing about. How do you make money blogging? How much do bloggers make? Can I make money blogging? Amazon Links. If we recommend a product like this photo scanner, and then a reader purchases that product, we receive a small commission for that sale at no additional cost to our audience. We’re careful about what we recommend, however, because, as minimalists, we want you to consume less and to consume intentionally. Affiliate Sales. When we recommend services such as Bluehost and Constant Contact, we receive a referral fee. Once again, though, that’s obviously not why we recommend these services. Virtually every hosting company has an affiliate program, so we think it’s best to recommend the companies we use personally. Speaking Gigs. As we built our audience, many organizations, universities, and conferences began contacting us about speaking at their events. At first, we starting speaking for free just to build a name for ourselves. Then, we started charging a few hundred dollars per event. Now, we’re able to charge significantly more money because the demand for our talks is so high. Writing Classes. I get countless questions about writing, so I’ve been able to transfer that skillset to help thousands of students improve their writing over the years. I teach a four-week online writing class designed to improve the writing of people at any skill level—beginner, intermediate, or professional. Speaking Tours. 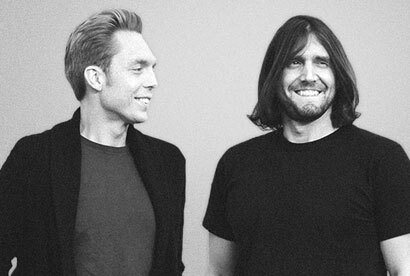 Over the past eight years, The Minimalists, have embarked on eight speaking tours, including 2017’s 50-city “Less Is Now” theater tour, which attracted an average of more than 1,000 people a night, with considerably larger audiences in bigger cities. Our 2014 “Everything That Remains” bookstore tour spanned 119 cities in eight countries and attracted 75,000 attendees. Audience Contributions. Since we refuse to clutter our blog or popular podcast with ads, we depend on audience support to fund production of our podcast. With more than 3,000 supporters on Patreon and many others via PayPal, our The Minimalists Podcast is fully funded with audience support, which means we’re able to pay for our podcast producer, filmmaker, and studio space without advertisements on our platforms. Through these various means, Ryan and I are able to earn a full-time income from blogging. But it’s worth noting that making money from your blog is not the best place to start. While there’s nothing wrong with making money—which you can do through affiliate links, advertisements, and your own products and services—the best reason to start blogging is because you have something to express. If you make money along the way, that’s great. In fact, if you help people solve their problems, you’re all but guaranteed to make money from your blog—eventually. Let’s just remember there are at least four resources that are more important than money: skills, time, energy, and attention. That said, let’s not kid ourselves by acting as if making money is irrelevant—it’s not. Making money from our blog is simply not the primary driver for our creativity. Although people often think of money as the ultimate resource, it is the least important of the five mentioned above. Money won’t necessarily improve your life, but it will amplify your existing behaviors. If you have bad habits, then more money will make your life considerably worse. And if you’re already a generous person, then more money can help you be more loving, caring, and considerate. What does blog stand for? What does blog mean? According to Wikipedia, a blog is a discussion or informational website published on the World Wide Web consisting of “discrete, often informal diary-style text entries (posts).” The term “weblog” was coined by Jorn Barger on December 17, 1997. The short form, “blog,” was coined by Peter Merholz, who jokingly broke the word weblog into the phrase we blog in the sidebar of his blog in 1999. Today, blogs have many shapes and sizes. Many are public journals people use to express their feelings. Others, like this blog, exist to help people think critically and solve problems. There are blogs that cover nearly every topic, ideology, and interest—from sports and politics to religion and travel and everything in between. Even the world’s largest news organizations—ABC, CBS, NBC, FOX, CNN, and MSNBC—all have their own blogs. Squarespace vs WordPress: Why should I use WordPress instead of Squarespace? It feels like we hear about Squarespace on every podcast. But when you compare Squarespace to WordPress, you soon discover that WordPress is superior in several ways. While Squarespace isn’t a terrible option, it lacks the personal control that’s available with WordPress. This is why every serious blogger I know uses a WordPress blog. Design (Themes). Squarespace provides some beautiful templates, but they’re limited by the number of designs that are available. Since WordPress is a free, open-source blogging platform, there’s an ecosystem of tens of thousands of themes ready to satisfy every want and need. Features (Plugins). 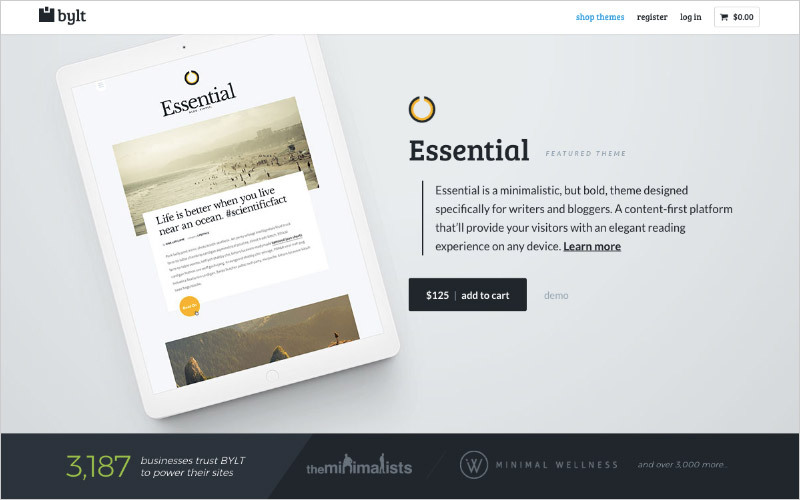 While Squarespace has a rich feature set, no platform can compare with the immense scale of features that WordPress offers. WordPress has a library of over 54,000 free plugins that can handle any task. While we suggest that you keep the number of plugins on your blog to a minimum, the level of customization provided by WordPress is unmatched. Plugins aside, one key feature that’s built in to WordPress, but not Squarespace, is version control. Version control tracks your changes and allows you to compare revisions and revert back to a version of your Page or Post from any point in time. I use this feature all the time because I know that if I’m unhappy with anything I’ve changed, I can quickly revert back to the previous version. This feature provides a failsafe that allows bloggers to compose, draft, edit, and publish their posts within WordPress itself, making it a complete blogging solution. You Own Your Content. Owning your content means that you have full control over what you express on your blog—and complete access to take that content and use it anywhere that you wish. To enable the latter, WordPress provides tools to export your data for use on any hosting provider that you choose to use. 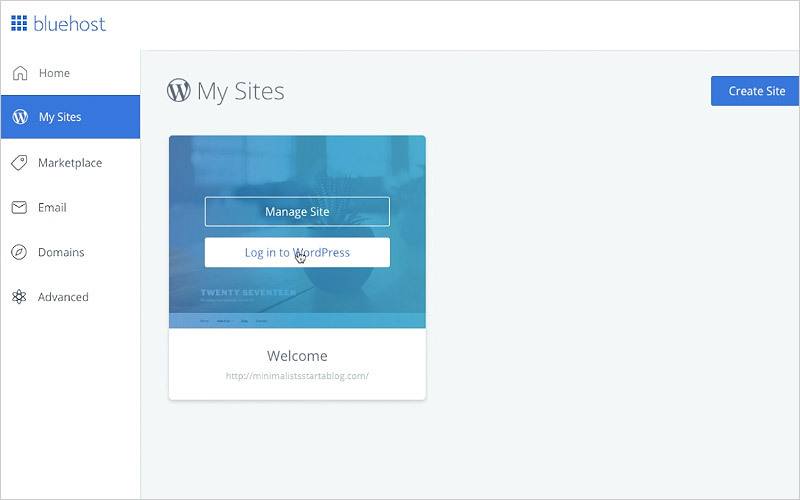 With Squarespace you can never truly download a complete copy of your server files or database, but with WordPress you can create an exact replica of your blog, at any point in time. This is most valuable for maintaining backups or in case you choose to start blogging with a new hosting company. With WordPress you have 100% ownership of your content, files, data, and design—and you can backup everything. SEO. Out of the box, both WordPress and Squarespace are search engine friendly. But with a single plugin WordPress elevates your SEO (Search Engine Optimization). A plugin we recommend for every blogger is Yoast SEO. This free WordPress plugin allows deep customization of your on-page SEO, but, more impressive, it provides automated content analysis. This helps guide you to improve and optimize your content for better readability and improved reach in search engines. While SEO isn’t everything, we all start our blogs in hopes that people will read what we’ve written. Following proper SEO practices can be a differentiating factor in reaching new people. Growth. WordPress is extremely robust and customizable. It allows you to build a blog exactly as you’d like. But what happens as your new blog grows? If you outgrow the off-the-shelf option, maybe it’s time to work with a designer to create a fully custom website that’s tailored to match your brand and image. Since WordPress provides you with complete ownership of the platform, it also provides a designer with the freedom to build and create without restriction. Nothing is off limits. The answer is in the question: the only way to become a blogger is to start a blog. This might sound overly simplistic, but that’s because it’s not that complicated. If you use the step-by-step instructions in this blog post, you’ll be blogging later today. There’s an old truism, “Writers don’t like writing; they like having written.” I think the opposite is true for bloggers: because of the instant gratification of the WordPress “Publish” button, I find that bloggers enjoy writing because they’re constantly sharing that writing with the world. The barrier of entry is gone, so start blogging if you want to become a blogger. It really is that simple. While the lines have blurred over the years, the simplest way to put it is that a blog is a type of website, one that catalogues, over time, the personal or professional thoughts and beliefs of a person or organization. As your thoughts, beliefs, and ideas change, so will your blog. It’s nice to have a time capsule of our thoughts, as they’ve evolved over the past decade. No, blogs are not “dead.” In fact, blogs are more alive than ever! As a matter of fact, our blog has grown every year since 2010 and now boasts more than 3.78 million readers and an email list that continues to grow every month. We often hear people say that you should blog about what you’re passionate about. That’s great advice if you know what that passion is. Maybe it’s technology, finance, baking, music, or rock climbing. If so, write about that! If, however, you don’t know what you’re passionate about, don’t worry. Passion isn’t simply stumbled upon; it is cultivated. What are your values? Whatever you write about, you want it to align with your values. What excites you? There will always be drudgery, but if you find something that excites you, you will be able to drudge through the drudgery. What makes you angry? If you aren’t excited by something, then anger is often a great motivator. If there’s something in the world you want to change, write about that. It will help inform and strengthen your values. How can you solve problems? You will feel fulfilled if you can provide solutions to people people’s problems. Coincidently, if you write about solving your own problems, that will help other people solve those same problems, too. What if money wasn’t important? If money wasn’t a factor, what would you do with your life? Yes, you need to make money, but, just as important, you want to do something meaningful. Write about that. Who is the person you want to become? Your writing should help you become the person you aspire to be. Write as if you’re writing to make your future self proud. What is a blog used for? What makes a good blog? A blog is used for two things: to express and to communicate. A good blog is able to marry communicative writing and expressive writing to create blog posts that are informative and entertaining. Message? What message am I attempting to communicate? Emotions? Does the writing express the emotions I want to the reader to feel? What are those emotions? Urgency? How can I make the narrative more urgent? Does this sentence serve a purpose? Can I cut this line and still preserve my message? How can I make this more concise? If I killed the first two paragraphs, would this piece be better? How could I restructure this sentence/paragraph to make it more climactic? How do you start a blog for free? The good news is that starting a blog is free with WordPress. All you need to pay for is hosting, as outlined in the step-by-step instructions in this blogpost. There are also other “free” amateur services like Tumblr or Blogger that allow you to start a blog on those company’s platforms. Just be careful, because you may not own your content if you’re posting it on someone else’s website. That’s why we use WordPress. When talking to my writing students, I recommend writing every day and publishing a blog post at least once a week. We usually publish two blog posts per week on this blog. Seth Godin blogs every single day. Whatever you decide, we recommend you stay consistent. Setting a weekly schedule helps you create accountability partners (your readership) so you feel compelled to write even when you don’t want to write. Avoid grandiosity. Avoid throat clearing. Your first blog post needn’t be a grandiose mission statement. And your first blog post doesn’t have to be a vapid, self-involved introduction to your blog. Instead, find one thing that interests you today and write about that. Use the prompts in the “What should I blog about” section above. For reference, you can read the first blog post on this blog, circa 2010: Be on the Mountain. Does Bluehost charge monthly or all at once? 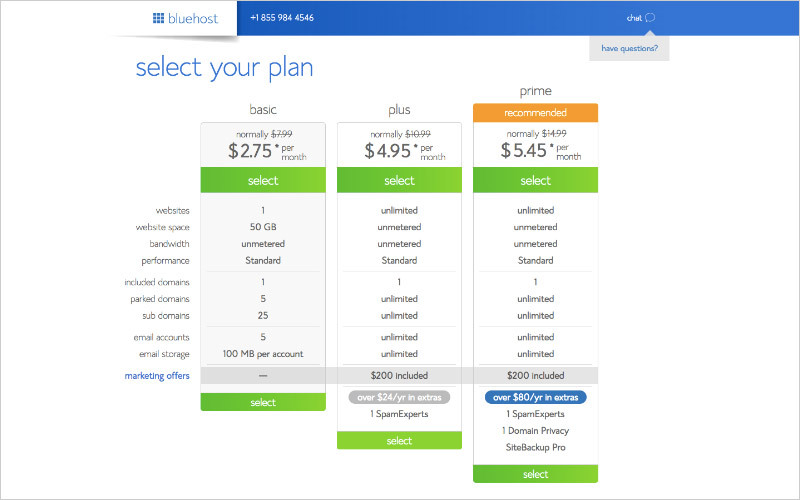 Bluehost bills annually, so when you use our link to receive the discounted rate of $2.75 per month you will be billed for the entire first year. That said, if for any reason you decide that it’s not right for you, Bluehost offers a 30-day money back guarantee. Tweet to @theminimalists with your question and a link to this essay and we’ll add your question.